Although he was born Lewis Arthur Mothersbaugh (1875-1941), our family knew him affectionately as “Uncle Bud.” Bud was married to my great-grand aunt, Maria Magdalena Raiffeisen. I never had the chance to meet him but I have gotten to know him through my grandmother Roma Siegel (1909-1988). As we sifted through Roma’s possessions following her death, I discovered a small leather-bound book that looked interesting to me. Later I would realize that this small book was Lewis’s diary from his time in the U.S. Marine Corps (1898-1902). I looked at the diary in the months and years that followed and figured out a few details, but never got much further until my uncle, Carl D. Siegel, passed away in 1999. In my uncle’s attic we found Bud’s service trunk that was filled with pictures, letters, and other ephemera. In addition to Bud’s mementos, Bud’s mother had lovingly kept every letter her son wrote home to his family. It was a treasure trove unveiling a life. In the intervening years I have begun to piece together Bud’s story. The oldest of eight children, Bud was born in Illinois to Samuel and Artie (Martin) Mothersbaugh 1. When Bud was four, the Mothersbaugh family moved to a farm near Syracuse, Missouri, in proximity to the Carl Raiffeisen family, my two-times-great-grandparents. Samuel Mothersbaugh farmed and tried his hand at mining. Life was hard but the neighborhood families shared food, families, friendship and love – in the good times and the bad. Making a living was difficult for a young man who could not afford to buy land. So at age 23, Bud set out to find his place in this world. He began with the railroad, working his way through Colorado and New Mexico, then on to California. While in California he heard of a job with good benefits where a man could save his earnings and perhaps have enough money to buy land in only a few years. On November 17, 1898, Lewis Mothersbaugh joined the United States Marine Corps 2. He wrote home to his parents explaining that he believed he could save at least $600 after only five years of service, maybe more if he was at sea during war…and he was 3. Bud’s letters home would detail his ship the USS Yorktown’s travel from Mare Island, California to Hawaii, Guam, Indonesia, China and the Philippines – all exotic places to a Missouri farm boy. According to his diary, Bud was involved in battle during the Boxer Rebellion in China in the summer of 1900 as well as several skirmishes with Spanish forces in the Philippine Islands before and after the events in China. He boarded enemy ships and was “allowed” to take items from them. He sent his brother a picture of a Spanish officer with his family that likely was taken from the officer quarters on the vessel. When writing to his parents he described what he saw and experienced in terms that his family would understand. In one letter from July 1899, he wrote that the Filipino natives didn’t like to wear much clothing and carried large knives. He said, “They all carry something like a corn knife in a scabbard” (what the Filipinos call a “Bolo” knife). Bud had his greatest adventure in China. On June 10, 1900, he arrived in Tientsin, where he would spend the next few weeks fighting against the Chinese rebels called the “Boxers.” For several consecutive days he wrote in his diary, noting the work to build defenses against enemy rifle fire and bombardments, as well as the battles he faced on a daily basis. Bud detailed the military actions, advancements and deaths that occurred. He wrote home to tell his parents he had survived the battle because he knew the Boxer Rebellion had been reported in the newspapers that his folks would be worried. He explained that the Chinese shells were not that effective, but the sound of a rifle ball is “what will cause a man to hug the ground. 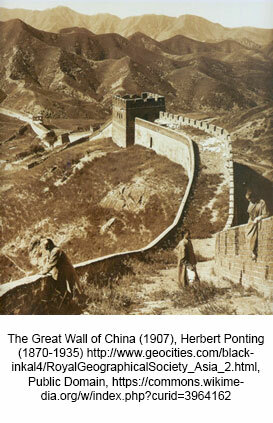 4” Perhaps a bit excited from the thrill of surviving the battle, he made a decision – he was in China after all. Lewis Mothersbaugh went absent without leave to see the Great Wall. Now that is a Missourian for you – he had to see if for himself. Keep following this blog to read more of Bud’s story! 2 Undated letter from Lewis Mothersbaugh to his folks. In author’s private collection. 3 Muster Rolls of the U.S. Marine Corps,  1798-1892. Microfilm Publication T1118, 123 rolls. ARC ID: 922159. 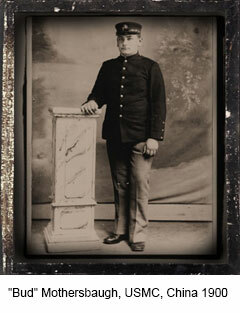 Records of  the U.S. Marine Corps, Record Group 127; National Archives in Washington, D.C. Provo,  UT: Ancestry.com, 2007. 4 Letter from Bud to parents, 4 July 1900, Tientsin,  China.